California Attorney General Xavier Becerra has announced arrests and charges against 17 individuals who were part of a robbery scheme targeting Apple retail stores across the state. The robberies resulted in a loss of over $1 million. The defendants are charged with entering Apple retail stores in large groups wearing hoodies and snatching products on display in a matter of seconds. The alleged crimes took place across 19 counties. So far eight of the seventeen are in custody. Arrest warrants have been issued for the other nine. The arrests stem from an investigation conducted by the San Luis Obispo Police Department and the Oakland Police Department, with the assistance of the California Department of Justice eCrime Unit. “The successful collaborative efforts of law enforcement has resulted in dismantling a large criminal ring," said Oakland Police Chief Anne E. Kirkpatrick. 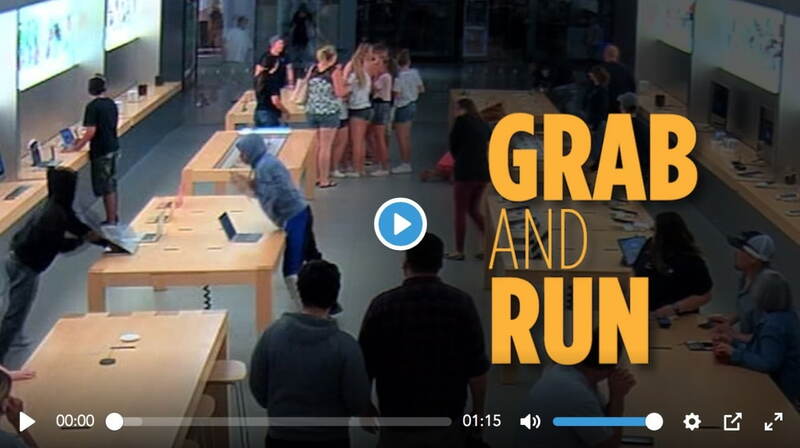 Click here to check out some footage of these grab and run robberies. Your a racist, your going to hell, god said love your neighbor, and he said that immigrants should be welcomed into your land. Now that is satisfying and I don't mean because I love Apple to death, it's how this organization tries to make quick cash by stealing the most expensive products on the market and how one robbery after another attempted to get away with it. I'll just stick to the Prize Vault machine (Keymaster clone under a different yet name) at Collin Creek Mall I go to and try to just win them out of that.